School traditions mark major milestones on the Path to Manhood, connecting students across grades and generations and keeping them firmly rooted in the history of the School. Traditions such as the Senior Buddy program and the All-School Christmas Party link upperclassmen with the Lower School, helping the older boys embrace their role as mentors. Others, such as Blue Shirt Day for seniors, signal new responsibilities and privileges that come with growing up. As a whole, traditions knit together the past, present, and future of St. Mark’s into one seamless brotherhood, joining the oldest alumni and the youngest students together with the shared experience of being a Marksman. Blue Shirts for Seniors. The normal school uniform is a white oxford cloth button-down collar shirt with grey shorts. During the last day of class for the junior class members, they “graduate” to the blue oxford cloth button-down collar shirt that is worn only by the seniors. They meet in the amphitheater for a breakfast and photo session wearing the blue shirts for the first time. Lower School/Senior Buddies. At the beginning of the senior year, the Upper School assigns the 12th graders a Lower School “buddy.” Depending on how many are in the senior class, lower schoolers in grades 1-3 are available as buddies. Throughout the year, the seniors and their buddies get together for lunch, a snack break, a trip to the zoo, among other activities. The senior and their buddy have a special moment together when the lower schooler rides into the annual All-School Christmas Party on the shoulder of his senior. The Pecos Wilderness Trip. Rising ninth graders are required to go on a 10-day trip to the Pecos Wilderness area in New Mexico. This is the culmination of the Outdoor Education Program that begins in the middle school years with overnight camp outs. The Pecos Trip is a rite of passage for the students leaving Middle School and going into Upper School. Faculty members, and other Upper School students who act as sherpas, guide the ninth graders on a hiking and camping trip that acts as a bonding experience for the class. McDonald’s Week. The Junior Class is in charge of this special Community Service effort each November. They plan activities for each of the four mornings leading up to the Thanksgiving Break. The local McDonald’s restaurant agrees to donate meals to the clients at the Austin Street Centre in downtown Dallas in exchange for the number of breakfasts sold to St. Mark’s and Hockaday students and their families during McDonald’s Week. T-Shirts with the logo of each McDonald’s Week are sold, and loose change is collected. This money is donated to the Austin Street Centre to meet the other needs of the homeless shelter. Father & Son Breakfasts. Once a year for each grade, an early morning breakfast planned by the Parents’ Association class representative is held in the Great Hall for each of these grades on separate dates. Geography Bee and Spelling Bees. A competition that leads toward the National Geography and the National Spelling Bees. The student who wins each of these at St. Mark’s goes on to compete in city-wide, state-wide, and national competitions if he wins at those levels. A St. Mark’s middle school student won the national spelling bee in 2003. Outdoor Program. Fifth-grade students go to Sky Ranch the first week of school as a bonding/fun/get acquainted activity with the teachers. The campouts of the Outdoor Program begin in 6th grade and continue once a year for grades 6-8. Monotony Breakers. Three times a year the parents provide special treats to the students during the morning break time. 7th & 8th Grade Community Service. Along with Hockaday students in the same grade, Marksmen in 7th and 8th grade have a unique Community Service activity once a year on a Saturday. 8th Grade Community Service Committee. This committee sponsors a coat drive in the Winter and gets some experience toward the Community Service Program they will take part in during their Upper School years. 8th Grade Holiday Dance. Held at St. Mark’s. Girls from the 8th-grade class at Hockaday are the invited guests. Middle School Final Assembly. Assembly of the whole Middle School at the end of the year is also the graduation for the 8th graders. Major Middle School awards are given as well as various recognitions of many of the boys in grades 5-8. Adventure Day. A first step in each class’s bond with sister school Hockaday, Marksmen fourth graders meet their Daisy peers for a day of games, introductions, and frozen treats. Fun Day. 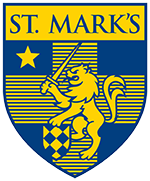 Each fall, St. Mark's and Hockaday host a joint carnival for students in grades 1–6. Fun Day is held on the St. Mark's campus every other year and features games, activities, food, and fun for students and parents. Lower School Leadership Wall. As part of the broader Character & Leadership education effort, boys research and nominate historical figures, past and present, to become part of the Leadership Wall in the Lower School lobby. Current honorees include George Washington, Rosa Parks, and Malala Yousafzai. Blue & Gold Day. Students take a break from classes for a field day of games and a lunch of grilled burgers and hot dogs on the green. Banner Chapel. During the Christmas season, students create banners to celebrate their faith and hang them in the Chapel during a special service. Upper School Buddies. Each first, second, and third grader is paired with a senior for several events throughout the year, including a trip to the zoo, hot chocolate, lunches, and one of St. Mark's most cherished traditions, the final All-School Christmas party, when seniors carry their buddies on their shoulders into the Great Hall to decorate the Christmas tree.